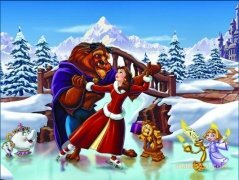 Disney is probably the best known animation film producer in the world and all their films usually become blockbusters worldwide. Stories like Snow White and the Seven Dwarfs, Alice in Wonderland, Cinderella, Sleeping Beauty, Aladdin, The Beauty and the Beast or The Prince and the Pauper, are better known due to the Disney movies than their original books. 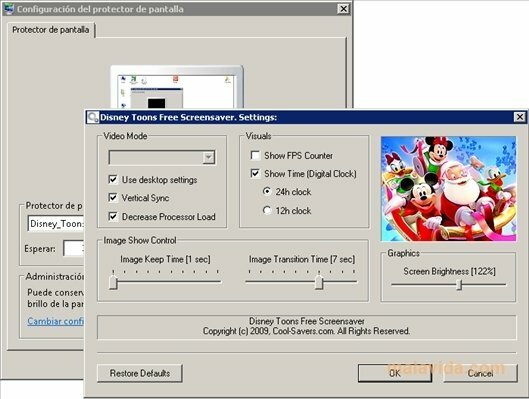 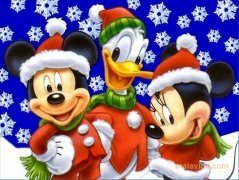 Now we have the change to enjoy several Disney characters on our computer thanks to Disney Toons Free Screensaver, a screensaver that will show us images of Mickey Mouse, Minnie, Donald Duck, Pluto, the Beast or Belle at Christmas, playing in the snow or dressed up as Santa Claus. We'll be able to configure how the images are shown, the transition time between each image, and the screen's brightness. Now you can give the youngest members of the household a lovely surprise, by putting their favorite characters on your computer with this Christmas screensaver called Disney Toons Free Screensaver.